Tumblr is a modern social media and blogging platform with 131 million blogs and 300 million unique users. It is among top 15 websites in the USA and top 100 in the world. With its help businesses can post promotional text and photos, and videos. Unlike Facebook or other platforms, you can use professionals to create unique HTML features. Twitter, for instance, relies on frequency and text in posts. Tumblr’s main park is a stream of images coupled with blogging. 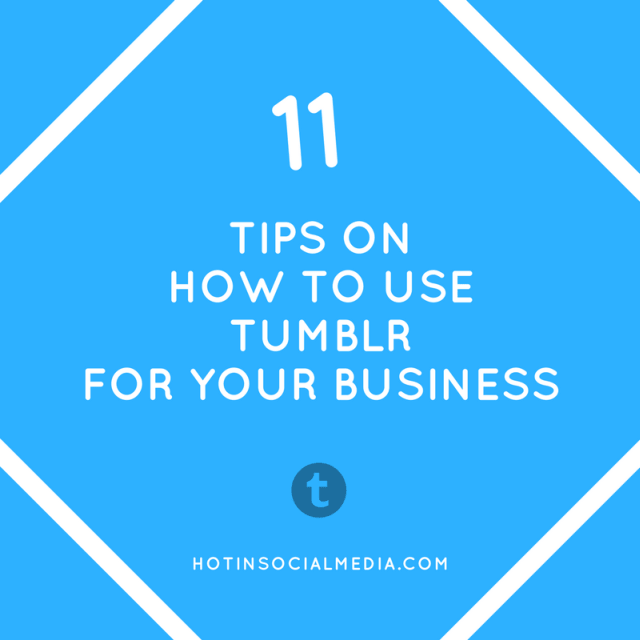 Tumblr has some key features and benefits that can be useful to business. That’s especially true when working closely with other social media platforms. Tumblr is great to use for Search Engine Optimization. And the benefits for small businesses are vast. Tumblr is a great choice for companies who do not want to develop their own website. It allows you to be indexed by Google and have a strong online presence. It also acts as a sharing network meaning any of your products can get reblogged hundreds of times. Images, video, audio and 250-word texts can be used in a variety of ways. So your marketing message should be concise and up-to-the-point. Tumblr is a great platform to promote brands, but few companies use it yet. According to Socialmarketingwriting, only 31 out of top 100 brands use Tumblr. This leaves a lot of options to promote your company. This is true especially when other social media platforms are overflowing with marketing content. And Tumblr is becoming more and more hip with a well-established firm following. It’s reasonable to assume that it can be a profitable tool to extend reach. When a company creates a customized page and posts quality content, it can more easily develop a strong presence on this platform. Small and large businesses can find this social platform beneficial. This is due to the plenty of discoverable tags, posts and reblogs options so that your company can get acclaim pretty quickly. But before you even try to create a full-fledged business account on Tumblr, it’s a good idea to search for your competition. Look closely at their success and failures. Follow blogs of rival companies and note the ones who are not present on Tumblr. By understanding which posts are hip for your industry to can get the most attention. Don’t forget that your blog should accurately represent your company. You can customize your web page on Tumblr the way you want, but posting too many kittens when you have a furniture store may not be right. By creative yet accurate representation you can create a targeted following. You should use pictures to create aesthetic appeal. This attracts people if they relevantly represent your business. Presenting your creative side results in showcasing your products or services in a way that is attractive to consumers. Create useful content. It’s like with any other social media. Tumblr requires publishing consistency of posts. The main point though is not to share content that isn’t worthwhile. Platform’s users are keen to engage with your blog posts, but the content should be relevant. Depict your company via product images, stories or services descriptions that you put an emphasis on your business. Publishing enduring content that stays up-to-date for months and can be re-shared is also a successful strategy. Don’t forget to use tags and creative images so that the info you share has the potential to be re-blogged in perspective. Producing responsive content, for this reason, is vital to your blog’s success. There are firm ways to create and expand your followers’ network on Tumblr. You can start by employing popular tags that are constantly searched to gain immediate exposure. If there are some industry-specific tags, you can easily track them to follow your competition and get to know the latest news. Make sure you have a balance of limiting the number of tags narrows your audience, and their plenty seems more like spam. The latest research by Inc.com, states that the best number of tags is from seven to twelve. This way you can reach enough people without filling up your message with too many hashtags. All in all, using Tumblr can let you expand your contacts network and find new ideas that are applicable both to Tumblr and other platforms. You’re sure to be faced with some challenges along the way, but the possible benefits outweigh all the trouble you may go through. Tumblr, unlike Facebook or Twitter pages, employs Search Engine Optimization. This means that Google indexes it. It also has plug-ins to share content on other social media sites, so that you don’t have to do the work twice. If you do have a website Tumblr is one of the key tools to drive extra traffic to your primary website landing page. This means giving a human face to your company. The vast majority of blogs are made by people for people. And presenting your brand on Tumblr should also take that into account. Follow other Tumblr business and private blogs. By re-blogging relevant posts, you can show that you are keeping a firm grip on the latest industry news, which is highly important. Always comment on people’s posts about your products, and respond to comments on your page. Try to engage the community in a friendly and positive way to earn their trust. Images, videos, website links, texts and other ways to engage people on the platform are all good tools to make your blog highly enjoyable. Take the extra step and add sharing buttons to Facebook and Twitter. This lets people repost more freely across many platforms. Indeed, there are many media tools at your disposal while using, but simply generating traffic for the sake of it is not worthwhile. But adding more targeted traffic via relative content greatly boosts your readers’ focus. Great images of your product ensure that people repost them to share with friends. Around 80% of all Tumblr posts are photos or GIFs, or other kinds of images, so make sure you use them to boost reblogging. Tumblr doesn’t make you pay to show your blog more often to people, like Facebook, does. It’s a completely free platform, and you don’t need to pay them a penny. This is great news for those with small to no promo budget. Organizations usually have to pay for extra features, increased publicity, etc. Use it 100% for free. It all depends on how and what you blog about and whether it is appealing to readers or not. You can easily connect your blog to Google Analytics to track your account and profile popularity and other statistics. This allows you to further enhance your marketing efforts. You will know better what works and what doesn’t in boosting online publicity. Interaction is at the core of Tumblr, and the more discussions you have going on, the better it is for your business. It’s a social networking site where organizations can interact with ease. There is no official business correspondence rule or alike. Link your Tumblr page to your main website for business communications. Tumblr boasts a one-of-a-kind tagging system where you need to start typing a company name or alike to instantly get relevant tags. With other social media sites, tags are tricky to use and not all users like them or even understand their purpose. With Tumblr, tags are widely used to discover content. With Tumblr, you can provide limitless links to garner traffic to your business website. These backlinks allow you to increase traffic to your landing pages to boost sales and make your website rank higher in Google search. Don’t forget to use relevant keywords and phrases in your Tumblr content. It’s not good when your page ends up in the “funny kittens photos” section. Do-Follow blog posts make readers want to visit particular pages for discounts or other benefits. All in all, Tumblr has all the tools to be an excellent platform for promoting your company’s’ brand. Tumblr is starting to take off, and it seems like a wasted opportunity not to join it and spread the message. Extend your reach as there are hundreds of millions of unique users coming to the platform on a weekly basis. Post high-quality content and gain a strong online presence. Veronica Hunt is an ed tech expert and an experienced blogger from Delaware City, DE. As a blogger, Veronica sees her purpose in providing her readers with up-to-date info in the spheres of marketing, entrepreneurship and psychology. Apart from work, Veronica adores traveling and yoga. You can contact Veronica on Facebook or Twitter.